We are reckoned as the manufacturer, supplier and exporter of Sandwich Roof Panel that is vastly used in households and industries as well. Known for its thermal transmittance, the range of roof panels offered by us is widely regarded in the market. 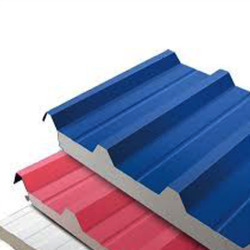 Ideal for roofing, these offered roof panels are highly demanded among our clients. Our organization is regarded among the leading manufacturers and suppliers of finest quality Sandwich Roof Panel. These panels are manufactured from premium quality raw materials, under the supervision of our team of experts. These panels are used in the roofing of residential or industrial buildings. These are appreciated by our clients for their thermal transmittance, high resistance capacity and durability. To fulfill the diverse requirements of our clients, we offer these panels in various dimensions. Looking for Sandwich Roof Panel ?